A while ago I reorganized my beauty stash and moved up a few products to test. 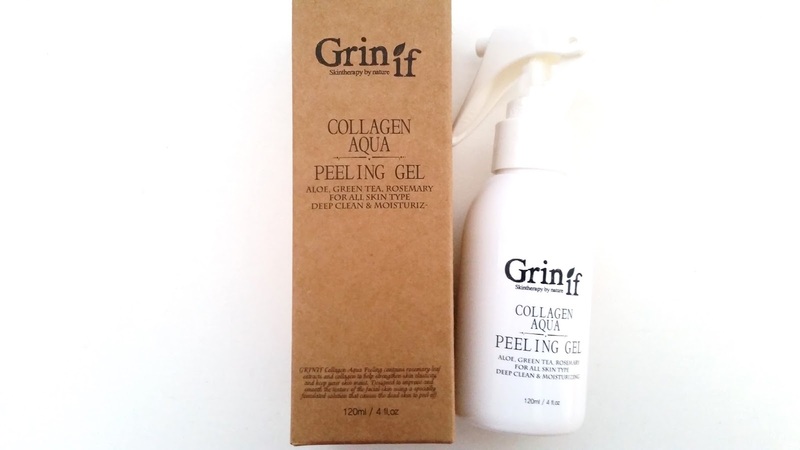 This Grinif Collagen Aqua Peeling Gel was one of them. I've liked the same peeling gel for years now and you guessed it, it's the Cure Natural Aqua Gel. I did try Secret Key's Lemon D-Toc, which is an inexpensive dupe of Cure's aqua gel. While I did like the D-Toc, it wasn't as gentle on my sensitive skin as Cure and it's got fragrances as well. Still, the price is amazing and it did the job. Since then, I wanted to try other peeling gels to see if I can find a better dupe for Cure. I started the search in my stash and found 2 for the test. I kind of regret picking Grinif first to test because of its ingredient list. You'll see later what I mean and it's more of a personal reason. The reason why I picked Grinif to test first is because this peeling gel is stored in a spray container. Much different than a tube or a pump. I thought that was interesting. 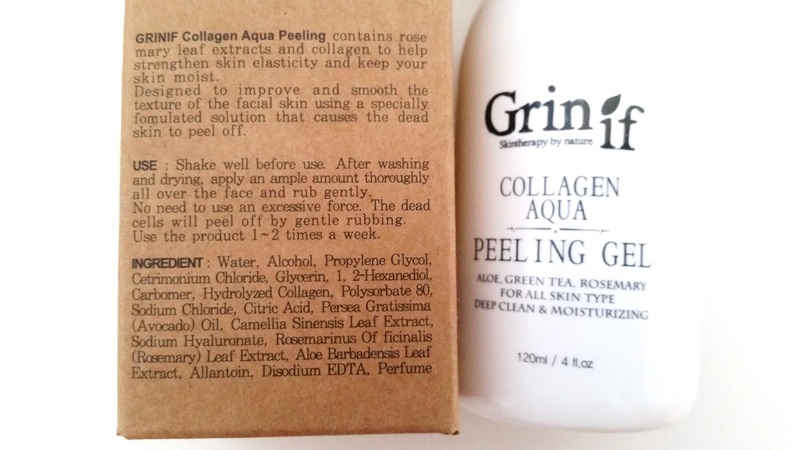 Plus I've never tried a collagen peeling gel before, so I wondered how that would be like. Product Description: A peeling gel that works to remove dead skin cells. Its formula contains multi-action enzymes and cellulose to effectively 'peel' the dead skin and uncover a smooth and soft complexion. This peeling gel can also help to remove impurities and provide a youthful glow. To Use: Shake well before using. Wash and dry the face first. 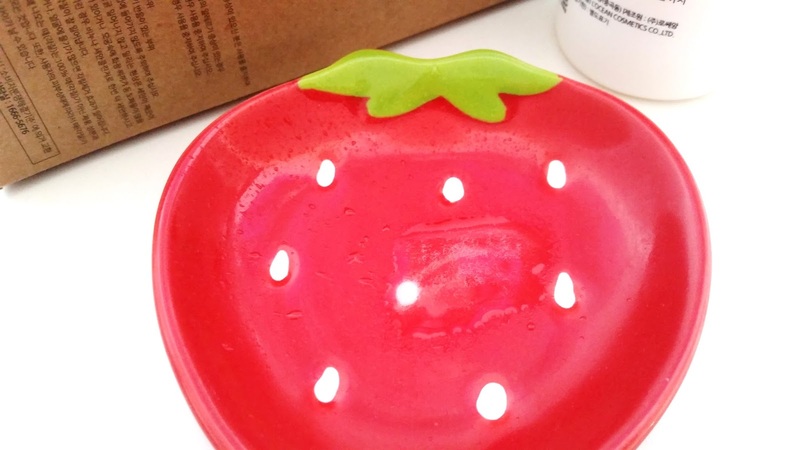 Apply an ample amount evenly over the face and massage gently. 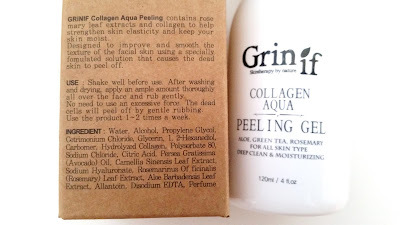 The dead skin and impurities well ball up with the peeling gel. Wash off with lukewarm water after. 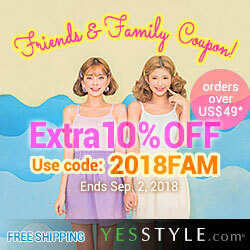 This product can be used 1 to 2 times a week. 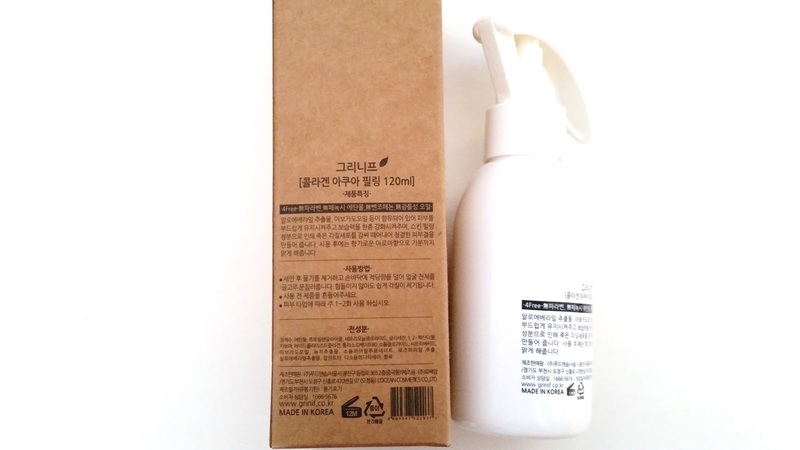 Ingredients: Water, alcohol, propylene glycol, cetrimonium chloride, glycerin, 1,2-hexanediol, carbomer, hydrolyzed collagen, polysorbate 80, sodium chloride, citric acid, persea, gratissima (avocado) oil, camellia sinensis leaf extract, sodium hyaluronate, rosemarinus officinalis (rosemary) leaf extract, aloe barbadensis leaf extract, allantoin, disodium EDTA, perfume. Packaging: Grinif has a very simple and to the point packaging style. 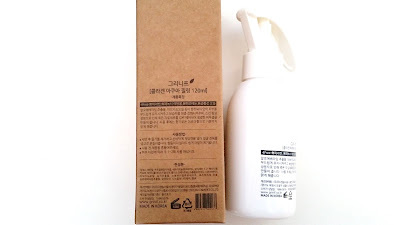 The outer box packaging contains a lot of information about the product, how to use the product, and the ingredients. 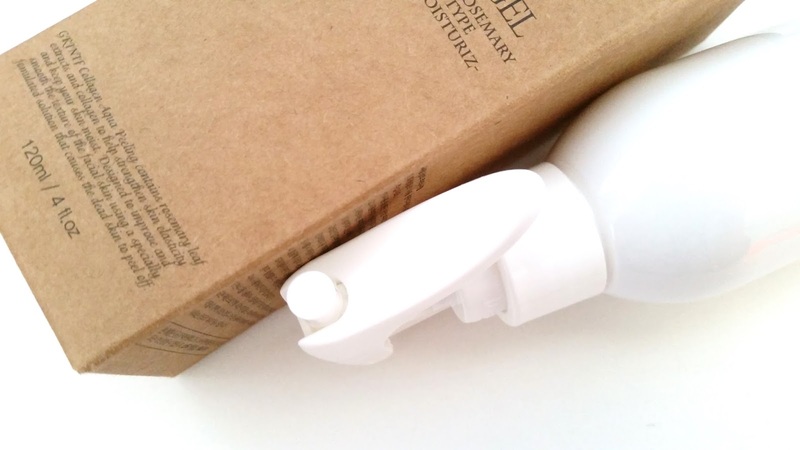 The product itself comes in a spray bottle which is different than the usual pump/tube peeling gel container. The spray top has a safety, which involves turning the plastic safety key to either its open option or close option. 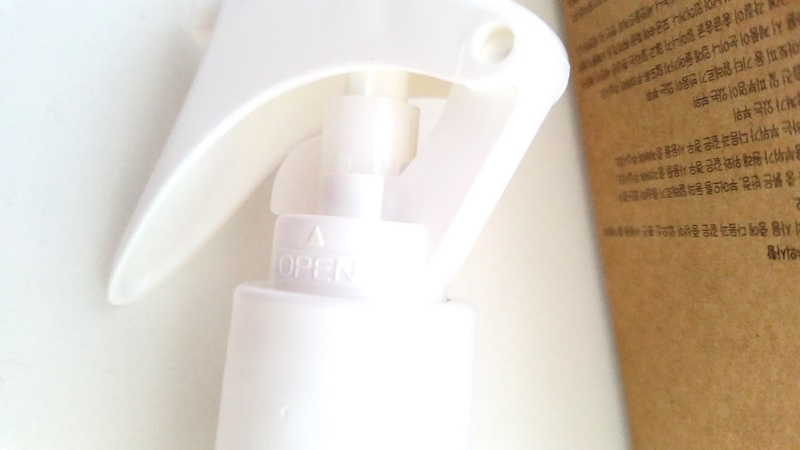 The open option will allow the spray top to function while the close option does not. Scent: There are a lot of scents in this peeling gel. The first scent you pick up when you first spray the peeling gel is alcohol. It's there and it wants you to know it. Once you start to massage the peeling gel, its citrus scent surfaces and takes over the alcohol scent. The 2 scents mixes together with other fragrances that I can't pinpoint and at some point it starts to smell like my dish detergent. Like those citrusy dish detergents. Color: The peeling gel is pretty much clear in color. Texture: This peeling gel is a lot more liquidy than other peeling gels. I wonder if it is made this way so it can be stored in a spray bottle or if the spray bottle idea came because the peeling gel is too liquidy. My Thoughts: The moment that I saw the ingredient list I knew this peeling gel might not be good for my sensitive skin. It has alcohol as its 2nd ingredient. Since I have sensitive skin, I can be sensitive to alcohol in certain products. Not in all products but mostly in products that contains a lot of alcohol. The only way for me to figure out whether I am actually sensitive to the product or not is to patch test it, and so I did. The skin on my face is more sensitive than the skin on my wrist/back of hand, so I had a feeling I might not get any negative reactions on my body as opposed to my face. Sure enough, my wrist was fine with this product. Then, I did a spot test on my face (on one of the less sensitive areas) and well, let's just say it didn't go too well. So this product never made it for the full face test. However, I did spot test it over my body and it didn't cause any sensitivities there. Then I did a full body test (minus the face) and it was okay. So now, this peeling gel for the face has become a peeling gel for my body. I think this might have worked as a face peeling gel for people who are not sensitive to alcohol. However, for those who are, it's probably best to avoid using this on the face, or re-purpose it if your body is not so sensitive to alcohol like mine. Just make sure to patch test! I do wish this peeling gel didn't contain alcohol because without alcohol it actually looks pretty decent. I also wish that it didn't have so many fragrances. The alcohol and fragrance mix makes the peeling gel smell like my citrusy dish detergent. Not something I'd like to associate with that's supposed to cleanse my skin. On a good note, the peeling gel has a bit of a brightening effect and I've been using it to brighten my knee areas and sometimes my elbows. Final Thoughts: Alas, this peeling gel did not work for me. I did leave it at 2 hearts because it does work like a peeling gel and works okay for my body. However, due to its alcohol content, it couldn't do its intended job which is to cleanse the face. This Grinif Collagen Aqua Peeling Gel also has a scent that reminds me of my dish detergent. Would I repurchase this in the future? Not likely. I think if I need to rank the peeling gels I've tried so far it would be Cure > Lemon D-Toc > Grinif. It's unfortunate the Grinif's peeling gel contains too much alcohol and it causes issues for my face. Do I think this is worth a try? Well, if you are not sensitive to alcohol and don't mind a lemony-alcohol scent, it might be worth a try. Although, it might be safer to go with either the Lemon D-Toc (if you are looking for something inexpensive) or Cure (if you are looking for something great for sensitive skin). Disclaimer: This product was purchased by me. All opinions are honest and my own.